Hi everyone, I am surprised that everyone is interested in Tarkans song for Emir and nobody cared for his other song, for Sibel Can. Because the song for Sibel Can is much nicer! I am not really impressed with Emir or with this new song, and Tarkans appearance in the video. To me Emir doesnt really look or sing like Tarkan, but he does his best to look like him, with his haircut, beard and eyeliner. But his face to me seems a bit boring. It seems with Emir, Tarkan doesnt want to make the same mistake twice, so they signed Emir at HITT and are putting full backup behind this young artist. But it seems to me that Emir doesnt have the same amount of singing talent or originality as Murat Boz. Emir is trying to be a Tarkan clone, and even his song title (I can't be you) and video refers to this. It's fascinating that Tarkan now has two newly composed songs out: the song by Emir, and a song by Sibel Can, which was issued in the same week almost. But while all the fan community is obsessed with Emir, nobody is discussing the Tarkan composition for Sibel Can. I think the Sibel Can song is nicer and more interesting than Ben Sen Olamam. It is much more Turkish, more orignial and has a typical Tarkan sound. Just like Cakmak Cakmak, Tarkan gave this song to Sibel Can because they are close friends. The song is called Cantada Keklik, (I thik it means: a cake in the bag- probably an expression). The title was first rumoured to be Cok Ayip (Shame on you) but this line only appears in the song lyrics. Thanks Inge for sharing this. I will check it out. I like this one a lot Inge. Very catchy. Thanks again. I like it too..."The Sibel Can's song" I don't know what it's saying, but I like the music. I've listen to Sibel Can's song a couple of times and honestly..I think "Ben Sen Olamam" is way much better. I'm not saying that just because I say it, it's like that...is my opinion. I liked both songs ! and do u know what !!!!!????????????? Thank you for that Informations . Murat Boz Is great , and I think he has more vocals than Emir . 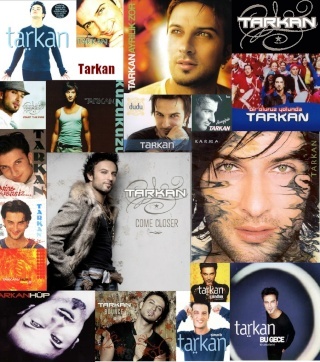 but I admire both , cause I can clearly sense TARKAN's magical touch in their works . Okay okay I'm an Emir fan now.. I like the Ben Sen Olaman song. Very catchy.. I woke up one morning with that song playing in my head. "wow".. but it's all good.. Speaking of Emir. Have you guys seen Emir's Eline Düstüm video? ....and he looks so much like Tarkan. I really liked Emir's new video as well. I think that it is a catchy fun song. He looks great in the video as well. (kisaiya) honey...PLAEASE!!!! can you post that photo somewere here on the forum. I'm talkin' about the picture from your avatar. I've never saw it before. And...God he looks gorgeous in it.